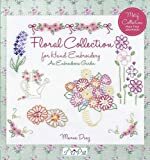 Maria Diaz, renowned for her cross-stitch design, shares her original love of hand embroidery in this beautiful embroidery sourcebook that offers great versatility both for experienced hands or those new to the craft. From fun motifs to pretty florals in a variety of sizes, the designs can be used to adorn anything from table cloths, towels, and cushions, to clothing. Each inspiring pattern has a color key and stitch suggestion indicated; beginners can simply backstitch the outline of the pattern to gain confidence, while experienced crafters can test their imagination by filling the shapes with any number of stitches in their repertoire. All embroidery techniques used in this book are clearly explained, and drawings that show the type of the embroidery for each part of the pattern makes the book easy to follow. Maria Diaz is a freelance needlecraft designer who has been published regularly in magazines and books worldwide. She is the author of the Cross Stitch Motif series and the Easy Cross Stitch series.